A search term that seems to bring a lot of people here is some combination of Grizzly Bear and .357 Magnum. It seems that a lot of folks are interested in the question of whether the .357 Magnum provides adequate protection against grizzly bears or not. I am not a big game hunter but I have camped in bear country and been closer to them than I ever desired to be. So, the following is a moderately informed opinion, but not what youd call expert advice, and if Yogi gets you on your next trip to Yellowstone, dont blame me. First, Id like to offer a bit of history on the building of the .357 Magnum legend. Back in the 30s when Smith & Wesson introduced the .357 Magnum, they wanted to demonstrate the great power of the cartridge. To this end, they hired professional hunters and equipped them with large N-frame revolvers with 8 barrels. These guns were loaded with the largest bullets and hottest loads they could handle without blowing up. With their loads, bullets, and long barrels, these revolvers produced awesome terminal ballistics. These expert hunters went into the field with these supercharged handguns and took elk, moose, and bears. A legend is born. The .357 Magnum will bring down a grizzly bear. Yes, Virginia, there is a Santa Clause. 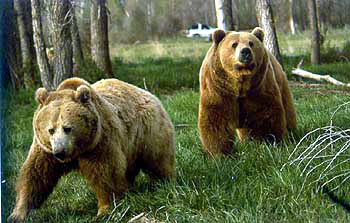 A note on grizzly bears: they are smart, strong, mean, bulky, motivated and fast. The grizzly bear is the one predator in North America that truly inspires terror in my heart. No matter what you can do, he can do it better. He or she can be merciless in defending turf or litter, and may just kill you for kicks. Because Smith & Wessons expert hunters with their hard-hitting revolvers were able to bring down bears with a .357 Magnum, does that mean that your Scandium framed 2 snubnose with wussy off-the-shelf loads will be able to do the same? Probably not. The expert hunter stalks the prey and takes the shot from the optimal range and angle. Ideally, the bear does not even know hes in danger. If you are hiking a trail and come upon a bear unexpectedly, you will not have the advantages of position, concealment and surprise. You will be drawing quickly and trying to get a shot off against a rapidly moving animal that may weigh 800 lbs. or so, and with a gun having considerably less power than the revolvers upon which the legend was built. In this scenario, the chances of getting a rapidly disabling hit on the bear drop to next to nothing. Unless you are extremely lucky, the bear is going to win this one. The .357 Magnum has the penetration to reach vital organs in the bear, but what are the chances of making that shot in an emergency? In this observers humble opinion, the .357 Magnum is marginal at best for protection against bears. I would want something considerably larger. In handguns, the .44 Magnum would be my baseline. A 12 gauge Express Magnum loaded with slugs would be a lot better.